One of the best-kept secrets of Times Square and often nicknamed the “hum,” Max Neuhaus’s “Times Square” sound installation is meant to be discovered by visitors on their own at the north end of the triangular pedestrian island located at Broadway between 45th and 46th Streets. Neuhaus intended the work to be passed by until it became a sort of personal encounter. In addition to “Times Square,” Max Neuhaus experimented with other public art sound pieces throughout New York City in the 1970s. These other installations include “A New Work (Underground)” in a sculpture garden grate at the Museum of Modern Art, “Walkthrough” in the Jay Street subway station and “Round” in the Alexander Hamilton US Custom House. You can find his “Time Piece Beacon” installation at the Dia Art Foundation in Beacon, NY. “Times Square” is open 24/7. You will certainly have a different perspective of the ‘Crossroads of the World’ once you slow down, step into and listen to this wonderful exhibit! 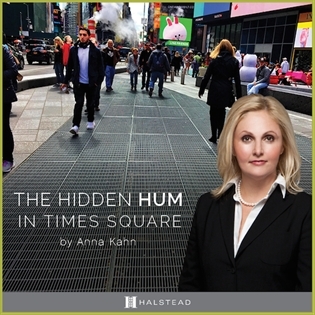 We hope you enjoyed this discovery of auditory art at Times Square by Halstead agent Anna Kahn. 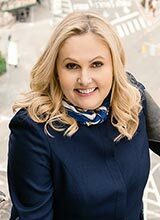 Anna is ranked in the top 1% of all real estate agents in New York City. She implements breakthrough technology and provides outstanding service with her in-depth market knowledge. Please contact Anna via email.